I’m back with the third video from my TRESemmé partnership featuring “Throw-Back-Thursday” inspired looks (click here to watch Boho Beach Waves tutorial, and here for Romantic Grecian Updo). Today I’ll be showing you how to create a super chic retro inspired bob – without actually cutting your hair of course! 1. Prepare by applying Thermal Creations Curl Activator Spray onto your hair to help shield and protect from heat styling. 2. Begin by sectioning off your hair. Taking approximately a 1 to 2-inch section of hair, start wrapping it around the wand – and hold for a few seconds. 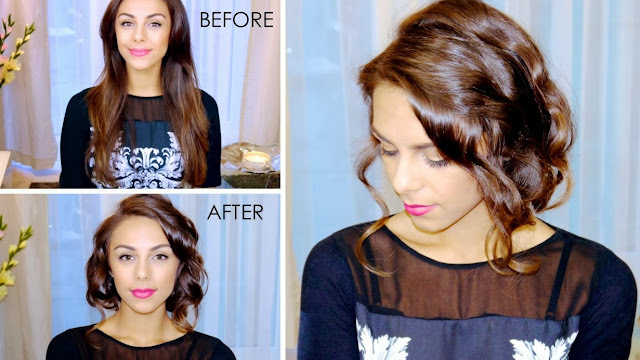 Vary the direction of the curls (inwards / outwards) to give a natural curly look. Once curled, drop the curl in your hand and allow it to cool before releasing completely. Repeat to rest of hair. 3. Gently brush through a few of the curls, and shake up the roots to give more volume. 4. Apply Fresh Start Dry Shampoo into the hair, which instantly freshens up the hair by eliminating odor and oil – as well as creating grip and texture, perfect for creating this style. 5. Section off the lower half of your hair and secure with a hair tie. Wrap the pony inwards, and tuck it under the base of your hair. Secure with bobby pins. 6. Release top half of hair. Re-curl any pieces of hair if necessary. Taking approximately a 2-3 inch section, start wrapping it inwards and tuck into lower bun created previously – making sure to not pull to tight, allowing the curl to keep its shape. Secure with bobby pins. Repeat to rest of hair. 7. Gently pull out a few sections of hair from the bob, allowing them to flow over naturally. Again, re-curl a few sections if needed. 8. Apply TRES Two Ultra Fine Mist Hairspray to keep your faux bob and curls intact. This spray goes on dry due to its water-free formula so it doesn’t feel sticky or stiff. Plus it will keep the hair resistant to frizz and humidity. I really love this hairstyle!!! You are rellay gorgeous!! I'm not much for faux bobs because they're always so hard for me to make, but this one was surprisingly easy!!! I love how it looks on you and it's a very fun way of changing your look! Wow, your hair is so shiny! I hope you had a lovely holiday Annie! Your hair looks gorgeous. Stunning! that hair style looks adorable! WOW!